Enrollment note: In the Schedule of Classes, CY PLAN 290B is listed as a 3-unit course. For technical reasons, students who enroll in CY PLAN 290B will register for a separate CY PLAN 298 for 1 unit so that all students are registered for a total of 4 units. The syllabus and assignments will be identical for all students regardless of which department they register in. Literature and urban civilization have long been intimately connected. Our seminar seeks to explore their connection as it relates to the emergence and global spread of the modern and contemporary city. How has the spatial and social organization of the modern city informed the thematic and formal choices writers make? And how, in turn, have the imaginative projections of literary texts shaped our experience of the city, its emancipatory potential and its alienating constraints? How exactly do cities get not merely mapped but also emplotted? What kinds of urban spaces and city-dwellers become the privileged focus of modern fiction and poetry? How do the density and scale of the urban built environment impinge on the way writers view the world and tell their stories? What genres seem best suited to rendering urban life? Is the city the defining context of modern literature or its implicit if barely human hero? To what extent is the global diffusion of the novel form related to the growth of urbanization? Our seminar will read texts written over two centuries located in Paris, St. Petersburg, Cairo, Mexico City and Lahore. Our authors will be Honoré de Balzac, Charles Baudelaire, Louis Aragon, Nikolai Gogol, Fyodor Dostoevsky, Andrei Bely, Naguib Mahfouz, Carlos Fuentes, Roberto Bolaño and Mohsin Hamid. We will relate the rise of literary realism and modernism to the aesthetic and cognitive challenges posed by city life. We will retrace the familiar story of Paris as the cradle of urban modernity but also complicate that story as we move beyond the West to Latin America and the Islamic world. Fuller's current long-term projects are two. One is a longitudinal, fieldwork-based study of the fascist regime's most ambitious showcase of agricultural and social engineering as well as comprehensive urban and regional planning: the 1930s reclamation and settlement of the 'Pontine Marshes' plain south of Rome. This is both an ethnographic study (Fuller is a sociocultural anthropologist by training) of the original settlers' descendants, who remain uniquely loyal to the memory of Mussolini and his regime, and an urban - architectural one, concerning the conservation of, and debates regarding, the urban fabric and distinctive Rationalist architecture of the area's five towns. The other long-term study is on a smaller scale. The walled city of Rhodes now belongs to Greece, but for several centuries it was an Ottoman possession, and for a few decades (1912-1943) it was under Italian colonial rule. At the time, although Italian archaeologists and planners were focused on excavating and restoring vestiges of antiquity at the same time as Italian rulers built a great deal of new infrastructure, no harm was done to the Ottoman edifices, such as mosques and baths. Since Rhodes has become a UNESCO World Heritage City (1988), however, and especially in recent years, traces of the era when Muslims ruled the city are being deleted, both passively through neglect and actively by demolitions. Fuller has been documenting the on-going 'Europeanization' of the walled city, already a tourist attraction, into one rife with small byzantine chapels and signs of classical antiquity, but only faint reminders of its Turkish character. Harsha Ram (Department of Slavic Languages and Literatures, Department of Comparative Literature, affiliation with Italian Studies), is the author of The Imperial Sublime. A Russian Poetics of Empire (2003), which won an Honorable Mention for the Aldo and Jeanne Scaglione Prize for Studies in Slavic Languages and Literatures (MLA). Since completing the book, Ram has been working in the field of comparative Eurasian modernisms and modernities, focusing on Russian-Georgian cultural relations and elaborating a case-study that spans the colonial, revolutionary and early socialist eras. His interest in cities derives from his decade-long work on Tbilisi (Tiflis), the Georgian capital, and its cultural life. His current and soon-to-be-completed book project is entitled City of Crossroads: Tiflis Modernism and the Russian-Georgian Encounter. The book is at once an account of the politics and poetics of crosscultural interaction between Russian and Georgian writers, poets and artists located in Tbilisi during the Russian revolution, and an account of the popular culture of the city, from street minstrelsy to the festive culture of the working classes, as it evolved during the colonial era. The convergence of a robust urban popular culture, the imported forms of modernist bohemia, and the conflicting aspirations of anti-colonial nationalism and social revolution gave Tiflis modernism its local flavour as well as its wider relevance. 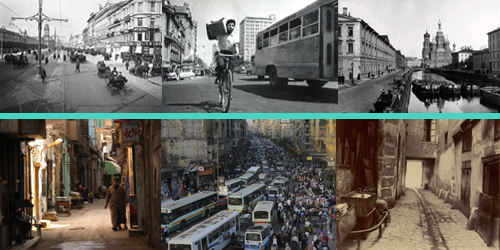 Theoretically, City of Crossroads seeks to make an intervention in the field of comparative modernisms, offering a genealogy of urban modernism that supplements and complicates the familiar Benjaminian account of the Baudelairean flâneur. It critically examines a largely unknown modernist archive that flourished on the edges of the European and Near Eastern cultural systems, thereby contributing to ongoing debates on “peripheral” modernities. And in pointing to the specific geographical location of Tbilisi as a crossroads city situated on a long-standing Eurasian trade route linking Iran, Russia and Europe, City of Crossroads suggests new ways to think about regional and world systems, ways that acknowledge but also fruitfully problematize the centre/periphery model currently prevalent in discussions of world literature deriving from world-systems theory.